The daisies are nearing their end here in north Idaho. Daisy season is one of my favorites -- firstly because it's an amazing thing to be literally surrounded by one's all-time favorite flower, and secondly because daisy season is the height of summer beauty. This is a mixture of daisies and dog fennel. Older Daughter and I went for a walk in our woods today so she could show me a large ant's nest. Once home, she made tiny slits in the stems and began weaving the flowers in a chain. Lydia rested her head on Older Daughter's feet. About half-way done. "I could never do this if I lived in a city," she noted, "unless I bought the flowers." Reminds me of many years ago (gosh, 20?) when my daughters and I would chase and capture lightening bugs in the fields next to our house. Ah, the simple things in life! "I guess they don't know just how bad these smell." As they might say in Caribbean patois, Life good, don't it?" Thanks for sharing your beautiful life, Lewis family. Is that pretty red hair I see? That first photo of the field is unbelievable! We don't get daisies down here, sadly. They're my favorite too. 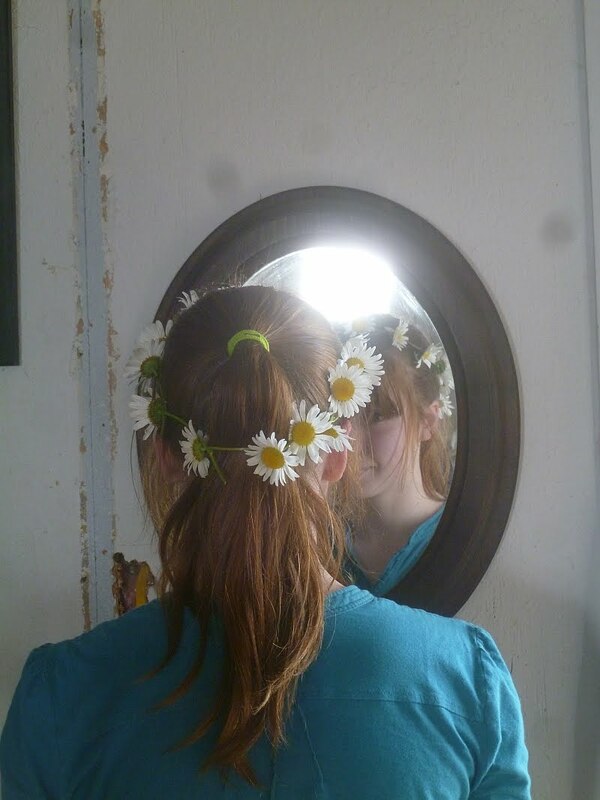 Brought back memories of making daisy chains when I was little and my daughter making them. Yes, that is indeed pretty red hair and a peek at a sweet fair face. This is a picture the Lewis family and all its generations hence will count as treasure. We call it "copper penny" hair. I haven't made one in over 60 years - shame on me! My Gram used to make them for me when I spent a summer on her farm, Blueberry Hill, in New Hampshire. was that a "fire ant" hill? No, thank God -- no fire ants here.